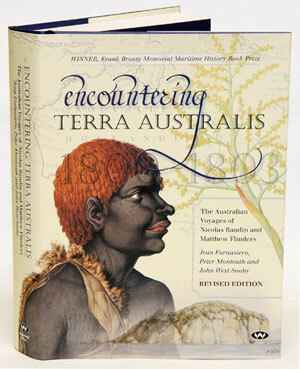 Encountering Terra Australis: the Australian voyages of Nicolas Baudin and Matthew Flinders. Artist/Author : Fornasiero, Jean, Peter Monteath and John West-Sooby. 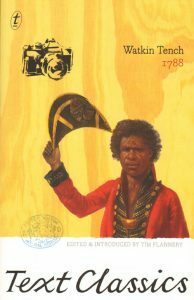 Traces the parallel lives and voyages of the explorers Flinders and Baudin, as they travelled to Australia and explored the coastline of mainland Australia and Tasmania. Unusually, the book takes its lead from the voyages of Baudin, rather than Flinders. Furthermore the authors have sourced original accounts including material which has never before been available in English. Wakefield Press, Octavo, dustwrapper, black and white and colour illustrations. 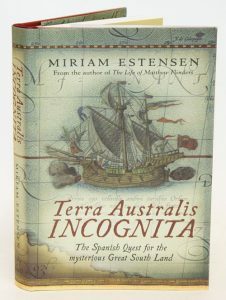 Terra Australis Incognita: the Spanish quest for the mysterious Great South Land. A new perspective on the intriguing story of the discovery of Torres Strait in 1606 and the search for the Great South Land., In October 1606, the great Spanish navigator Luis B ez de Torres took two vessels through the waters that divide the land masses of New Guinea and Australia. In a journey of great adventure, courage and hardship, he was the first European to sail through today’s Torres Strait and very possibly the first European to sight the east coast of Australia.Terra Australis Incognita focuses new light on the Spanish voyages of discovery that sailed from South America into the unknown south western Pacific in the late 16th and early 17th centuries. Crossing the planet’s largest ocean in small wooden ships with rudimentary navigation, these Spanish conquistadors were in search of the legendary Great South Land first imagined by the ancient Greeks.This is a story of passionate beliefs, of high hopes and catastrophic failures, of attempted colonies that ended in death and disaster, of violent confrontations and tentative friendship with indigenous people, of a fierce clash of cultures, and relentless ambition in search of the gold of King Solomon’s Ophir., It is also the story of the visionary adventurer Quir s who planned a New Jerusalem in today’s Vanuatu, the ruthless woman governor Dona Isabel, the Solomon Islander chief Bilebanarra who was a friend of the Spaniards and, of course, the great leader of men Luis B ez de Torres.Terra Australis Incognita is a thoroughly researched, lucidly written and unique narrative on the little known history of the great Spanish explorations of the Pacific Ocean. In 1788 Watkin Tench stepped ashore at Sydney Cove with the First Fleet. This curious young captain of the marines was a natural storyteller. His account of the infant colony is the first classic of Australian literature. 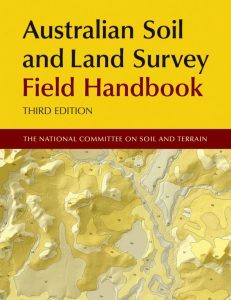 Australian Soil and Land Survey Field Handbook. Artist/Author: National Committee on Soil and Terrain. This handbook specifies methods, standards and terminology used in soil and land survey investigations related to practical problems of land use and the scientific study of land and soil. It has been widely used and adopted as a standard throughout Australia, providing one reference set of definitions for the characterisation of landform and vegetation and for the description of soils. The handbook advocates that a comprehensive suite of land and soil attributes be recorded in a uniform manner. This approach is held to be more useful than the allocation of land or soil to preconceived types or classes. Its usefulness is enhanced where computer facilities are available. This revised edition contains significant changes to the Vegetation chapter and revisions to the Location chapter bringing it up-to-date with the use of Global Positioning Systems (GPS) and changes to the Substrate chapter relating to the regolith. This title allows for systematic recording of field observations. It lists attributes necessary to describe site and soil conditions. It’s definitions of attributes, terms and categories are internationally consistent but particular emphasis is given to Australian conditions. It suggests coding for attributes, terms and categories to allow concise recording systems to be developed for field use. 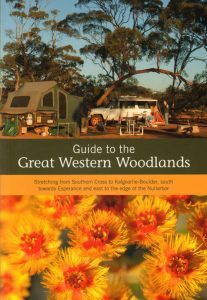 Guide to the great western woodlands: stretching from Southern Cross to Kalgoorlie-Boulder, south towards Esperance and east to the edge of the Nullarbor. Artist/Author: Thomson-Dans, Carolyn, et al. A comprehensive guide to this vast area of Western Australia’s heartland. Covering some 16 million hectares, the region has many delightful places to visit, secluded camping areas and historic attractions. 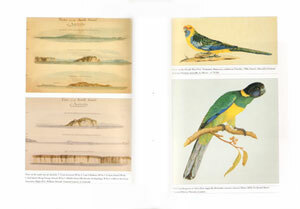 The second section of the guide includes information and photographs of trees, wildflowers, mammals, reptiles and birds.